President George W. Bush authorized the use of torture. President Barack Obama directed the extrajudicial killing of an American citizen in Yemen. What President Donald Trump will do remains to be seen, but it is broadly understood that a president might test the limits of the law in extraordinary circumstances—and does so with advice from legal counsel. 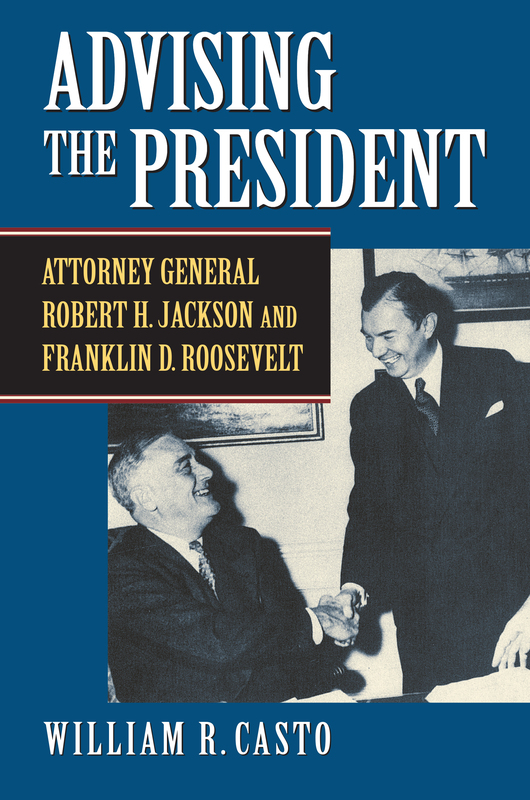 Advising the President is an exploration of this process, viewed through the experience of President Franklin D. Roosevelt and Robert H. Jackson on the eve of World War II. The book directly and honestly grapples with the ethical problems inherent in advising a president on actions of doubtful legality; eschewing partisan politics, it presents a practical, realistic model for rendering—and judging the propriety of—such advice. Jackson, who would go on to be the chief US prosecutor at the Nuremberg war crimes trials, was the US solicitor general from 1938–1940, US attorney general from 1940–1941, and Supreme Court justice from 1941–1954. William R. Casto uses his skill and insight as a legal historian to examine the legal arguments advanced by Roosevelt for controversial wartime policies such as illegal wiretapping and unlawful assistance to Great Britain, all of which were related to important issues of national security. Putting these episodes in political and legal context, Casto makes clear distinctions between what the adviser tells the president and what he tells others, including the public, and between advising the president and subsequently facilitating the president’s decision. Based upon the real-life experiences of a great attorney general advising a great president, Casto’s timely work presents a pragmatic yet ethically powerful approach to giving legal counsel to a president faced with momentous, controversial decisions. William R. Casto is Paul Whitfield Horn Professor at Texas Tech University. His many books include Foreign Affairs and the Constitution in the Age of Fighting Sail and The Supreme Court in the Early Republic.